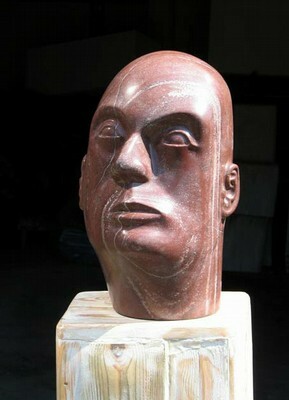 I have been working with sculpture for many years. Pewter, bronze and stone in different periods. On the exhibition you can see heads in stone.There are granite, basalt and other kinds of hard rocks, from which I have cut, grind and polished “personalities”. You can experience them with both eyes and hands, I think. They are smooth and “soft”, hard, heavy and unique. I also work with pewter and bronze. In pewter I have formed nature, pieces of nature, as small worlds. There are trees, mountains and steeps, sculptured landscapes. Gradually the human being came in and got larger space. I formed groups of people who are close to each other. They are standing in coast-near areas. In the exhibition I also show some paintings.